Atitude: It grows at elevations of 900 to 1550 metres above sea level. Habitat and Ecology: The species occurs in xerophyllous scrub on limestone or calcareous soils. Sclerocactus uncinatus is scattered and not abundant, it is not affected by any known major threat. The habitat of Sclerocactus uncinatus is home to succulent flora and is particularly rich in local endemics such as: Echinocereus pectinatus, Echinocereus stramineus, Escobaria strobiliformis, Astrophytum crassipinoides, Ariocarpus retusus, Ferocactus steinesii, Neolloydia matehualensis, Mammillaria candida, Lophophora williamsii, Thelocactus bicolor, Thelocactus heterochromus, Astrophytum myriostigma v. tulense, Echinocactus horizonthalonius, Agave lechuguilla, Fouquieria splendens and many other. Sclerocactus uncinatus subs. crassihamatus var. mathssonii (Berge ex K.Schum.) nov. comb. ined. Echinocactus mathssonii Berge in K.Schum. 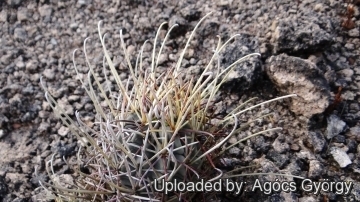 Echinocactus uncinatus var. wrightii Engelm. 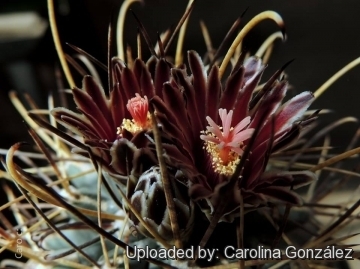 Glandulicactus uncinatus var. wrightii (Engelm.) Backeb. Sclerocactus uncinatus subs. wrightii f. cristatus hort. Ancistrocactus uncinatus subs. wrightii f. cristatus hort. 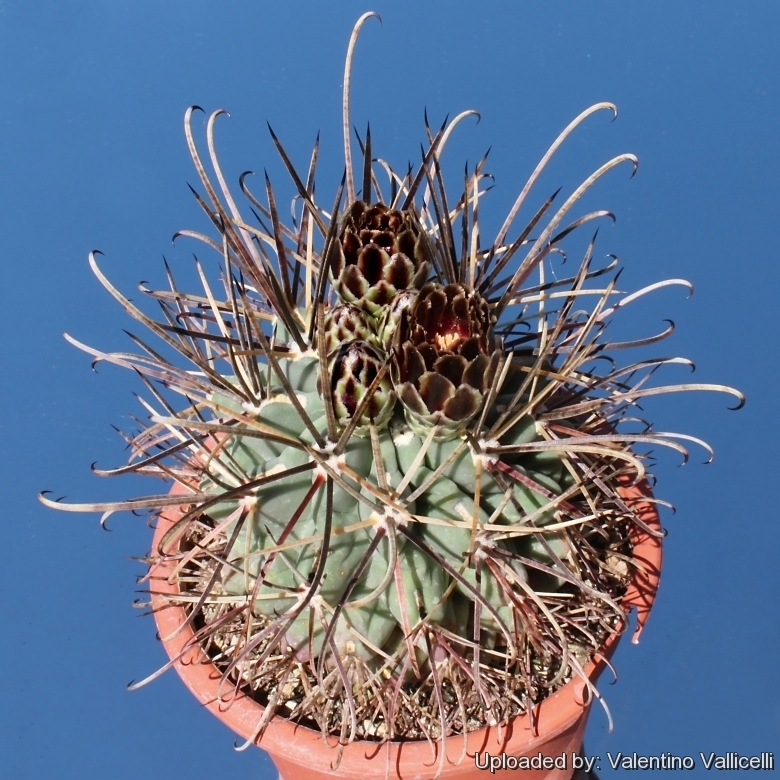 Echinocactus uncinatus var. wrightii f. cristatus hort. Echinomastus uncinatus var. wrightii f. cristatus hort. Ferocactus uncinatus var. wrightii f. cristatus hort. 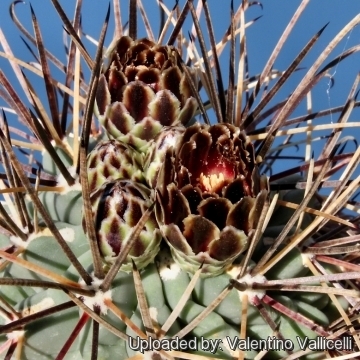 Glandulicactus uncinatus subs. wrightii f. cristatus hort. Glandulicactus wrightii f. cristatus hort. Hamatocactus wrightii f. cristatus hort. 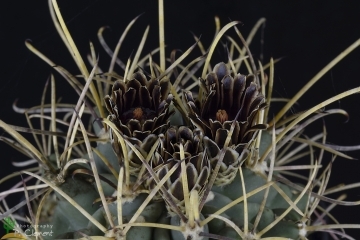 Pediocactus uncinatus var. wrightii f. cristatus hort. 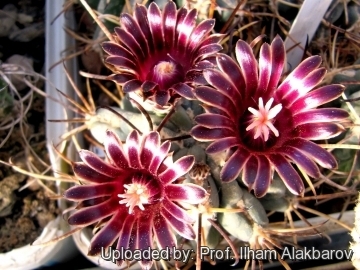 Thelocactus uncinatus var. wrightii f. cristatus hort. 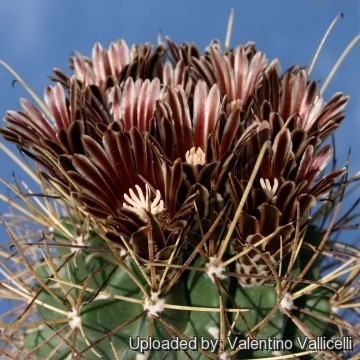 Description: Sclerocactus uncinatus (more often listed under its old name Glandulicactus uncinatus) is a solitary cylindrical cactus. Three subspecies are recognized, the nominate form, subsp. crassihamatus (F.A.C.Weber) N.P.Taylor and subsp. wrightii (Engelm.) N.P.Taylor . Stem: Up to 20 cm tall, 8 cm in diameter. Areoles: Elongated on sexually mature plants. Radial spines: 7 or 8 reddish straight ones, but the abaxial radial spines are consistently hooked, too. Flowers: Broadly funnel-form-campanulate, diurnal, dull pink to dark red, or russet or brownish purple to almost black, 2-4 cm long, up to 3 cm in diameter. 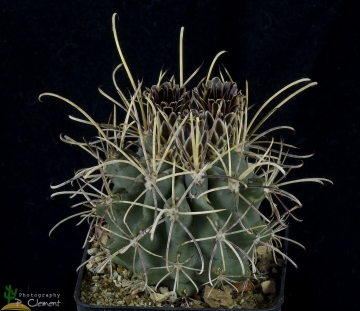 Sclerocactus uncinatus (Galeotti) N.P.Taylor: subsp. uncinatus has usually only a single hooked central spine that points obliquely outward and 7-8 radials; Distribution: Mexico (Mostly around San Luis Potosí). Sclerocactus uncinatus subs. crassihamatus (F.A.C.Weber) N.P.Taylor: has 5 central spines and about 8 radials, the lowermost ones hooked. Distribution: Queretaro, Mexico. Sclerocactus uncinatus subs. crassihamatus var. mathssonii (Berge ex K.Schum.) nov. comb. ined. : has shorter but stronger spines. Distibution: Southern part of the areal, Guanajuato, Mexico. Sclerocactus uncinatus subs. wrightii (Engelm.) N.P.Taylor: has a long central spine that points upward and 8-10 radials. Distribution: Northern part of the areal, United States and northern Mexico. Sclerocactus uncinatus subs. wrightii f. cristatus hort. : Crested form. 4) Goettsch, B.K., Terry, M., Heil, K. & Corral-Díaz, R. 2013. Sclerocactus uncinatus. In: IUCN 2013. "IUCN Red List of Threatened Species." Version 2013.2. <www.iucnredlist.org>. Downloaded on 18 February 2014. Cultivation and Propagation: This plant is relatively rare in cultivation and has the fame to be difficult to grow on its own roots because it is very sensitive to overwatering (rot prone) and slow-growing. 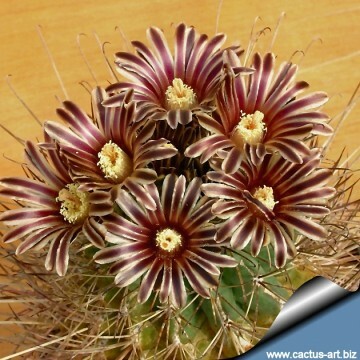 This species is extremely xerophytic, cold hardy and adapted to very dry soils. Soil: Grow it in an open mineral, sandy-gritty cactus compost. Pots: It needs a relatively large or deep pot to accommodate its extensive roots and provide a very good drainage. They may stay in the same pot for many years. Watering: Water it sparingly and keep it completely dry during winter or when night temperatures remain below 10° C. Mature individuals easily rot and die especially after planting so be extremely cautious with watering. Water it less than average if in bigger pots. Special need: Provide very good ventilation. Nearly all problems occur as a result of overwatering and poor ventilation, especially when weather conditions are dull and cool or very humid. They must have very dry atmosphere. Exposure: It will do its best with lots of sun and become stressed with inadequate light which could result in poor growth and unnatural shape. Hardiness: An unheated greenhouse would be perfect. It can survive low temperatures, approx. -7° (-12°) C.
Use: This is a good pot plant suited for a non heated green house. It can be also cultivated outdoors in raised beds, terraces if sheltered from winter rain. This cactus continues to be, a particular prize among collectors. Propagation: Seeds are relatively easy to germinate, but some seedling die each year. The seeds can be sown in pots of fine, well-drained sandy soil, any time during the spring when temperatures are warm. Cover the seeds with a fine layer of grit and water from below with a fungicide to prevent damping off. For the 1-2 weeks cover the pots with a sheet of glass/clear perspex to keep the humidity levels high. Remove the glass and replace it with light shade-cloth and mist once or twice a day for the next two weeks after which most seeds should have germinated. From then on mistings can be reduced to every second and then every third day as the little plants grow. Grafting is often used to speed growth rate and to create a back-up for plants in collection. There are a total of 27 Photos.